Coming from a ranching background and growing up in eastern Oregon, I didn’t always realize how lucky I was to have mountains to ride in, cows to chase, and the total blessing of having a horse with which to share these adventures . For me riding was always ‘outside the box’ and unbelievably, I never set foot inside an arena until I was nearly 30 years old! I had the good fortune to experience how the environment, especially working with cattle, can set things up for a great partnership with your horse. In this series of articles we will encourage you to get out of the arena and stretch the boundaries of the experiences between you and your horse. 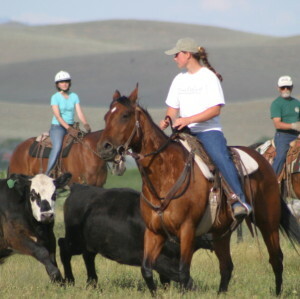 Let’s look at some exercises that will prepare you to read livestock, both horses and cattle. Ultimately, you will be setting things up so that your horse looks forward to the maneuvers that influence the movement of the cattle and give purpose to the exercises you have been practicing. Half-pass, leg-yield, turn on the haunches become necessities to get a job done and soon both you and your horse look forward to the work. Can You Have a Ranch Horse and a Dressage Horse?